To Upload photos up to 20MB please click here tavernierscience@yahoo.com. You can upload photographs larger than 20MB by creating a free account with Dropbox.com and sending the photos to lcanavan@audubon.org. This way there is no file size limit. Please do not just email directly. The emails will not go through. Instructions will be shown AFTER you submit this form. To expand upon its 75-year history of roseate spoonbill data collection, Audubon of Florida scientists began banding the birds in Florida Bay and Tampa Bay in 2003. The purpose of the banding program is to collect information regarding the dispersal of spoonbills from their natal colonies, and to determine various life metrics such as age at maturity and longevity. Reported sightings of banded spoonbills help us to understand their movements, thus allowing us to better target our efforts to protect and improve their habitat. 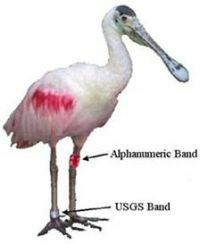 Spoonbills have been banded in Florida using a combination of band types. Please proceed to Step 2 to identify which type of band(s) you observed and to submit your sighting. Provide sighting information in online form and complete all sections applicable to your sighting. Please submit one form per spoonbill sighted. Please note: This will only be used if we need to contact you about your sighting. An aluminum band from the USGS Bird Banding Laboratory is used on all banded birds. This band is aluminum (silver) in color and is placed on the tarsus (just above the feet). The USGS band will always be on the opposite leg of any other bands present. The code on this band is not intended to be read from a distance, but rather to identify the bird if it is ever recaptured or recovered. 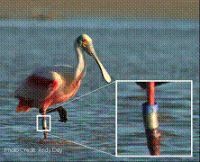 In addition to the USGS band, one or more colored bands may have been placed on the tibia (above what appears to be the "knee") of the opposite leg, so that the bands may be observed while the bird is foraging in shallow water. These colored bands may be metal with an alphanumeric code, PVC with an alphanumeric code, or plastic without an alphanumeric code. Please note that if a plain, colored plastic band is present, it will always be paired with a colored metal alphanumeric band (located above the alphanumeric band, on the same leg, as in the photo below). Therefore, if you see two bands on the same leg, they are likely a metal alphanumeric band paired with a non-alphanumeric (plain) colored plastic band. As you can see from the photo below, the metal alphanumeric bands have faded in the spoonbill’s saltwater habitat, which is why birds banded beginning in the 2008-09 nesting season wear PVC bands. More color options are available in the PVC bands and therefore the plain colored plastic bands will no longer be used. Because of these changes, detailed information regarding the type of band(s) you observed and whether or not a band appeared faded are essential. For example, the bird in the photo to the right has a plain, blue plastic band over a very faded metal alphanumeric band that appears to have been black originally. 1. What type of bands did you observe? If you observed a band with an alphanumeric code, what was the color? How certain are you of the color? Which leg was the alphanumeric band on? How certain are you about which leg the band was on? Was the lettering on the band vertical or horizontal? Could you read the alphanumeric code? How certain are you of the alphanumeric code? If you observed a colored band without an alphanumeric code, what color was it? In what county was the bird observed? Where was the bird located? Be as specific as possible. Examples: "Florida Bay" is helpful, "near Lignum Vitae Key in Florida Bay" is more helpful, "the mud flat 100 yards south of Lignum Vitae Key in Florida Bay" is very helpful. How were the coordinates acquired? Please describe any additional information you wish to convey (e.g., behaviors, unusual circumstances, plumage, etc). Please double check the entered information before clicking the "SUBMIT YOUR SIGHTING" button below. Please submit only one form per spoonbill sighted. Return to this page to submit additional sightings. Copyright by National Audubon Society, Inc. All rights reserved.